The Pinnacle’s ShowCenter 250HD isn’t a device that’s going to win any awards for design; its looks are best described as functional. The front panel is adorned with a power button and a single USB port. We know this makes it easier to plug external hard drives in, but why not hide it behind a flap or put it round the back? Moving round to the rear of the unit, we find a surprising omission: no HDMI port. So if you want the HD output that the unit is designed to use, you’ll have to connect the ShowCenter to your TV using component instead. In addition, you must then connect the audio to an amplifier if you want any sound. While most HD TVs will have component input, it means making two connections instead of one. At least there’s no shortage of audio connections, with both coaxial and optical ports for digital audio and two pairs of analogue RCA ports. Users of standard definition TVs can use SCART, S-Video or composite. 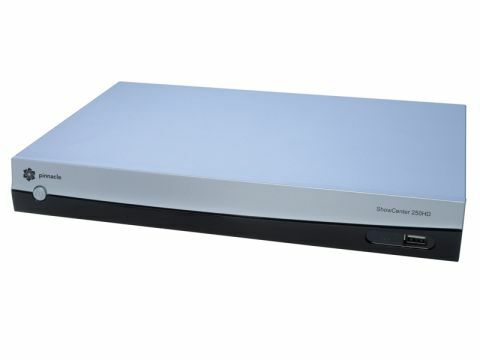 Don’t expect any software in the box – instead, the ShowCenter HD250 connects across your network to any PCs running Windows Media Player 11, so if you haven’t already installed it then you’ll need to upgrade. Having said that, it also works with the Philips Media Manager software. The unit will also connect to any UPnPcompatible NAS drives that you have on your network. Although there’s an Ethernet port, most people don’t have Ethernet inputs near their TV sets and so will rely on the 802.11g wireless connection instead. The default setup out of the box is to use the SCART connection, so if you choose to connect another way then you have to keep stabbing at the TV source button on the remote until you see the setup screen, at which point you can change the output preferences for your particular needs. Setup is reasonably simple, although like all these devices, if you need to enter IP addresses, server names or wireless encryption passwords, you have to use the keypad as you would a mobile phone. However, you should only have to do this once, so it’s not too much of a hassle. Once set up, the PC running Media Player 11 with the shared library should be listed, and once selected you can then choose to watch videos, look at your pictures or listen to your music. Here’s where we ran into a problem, though. With Media Player set up on a Windows XP machine, we could see but not play any content. Yet as soon as we switched to a Vista machine, everything worked as expected. This would seem to be more of a Windows problem than any fault of the ShowCenter, though. Content can also be viewed on an external hard drive using the USB port. Picture quality is good, even for standard definition content that’s upscaled, although there’s some delay between a video being chosen and the movie actually beginning to play. The price is attractive, but there’s nothing terribly innovative here and the ShowCenter 205HD will face stiff competition from a raft of new devices that will be hitting the shelves over the next few months.